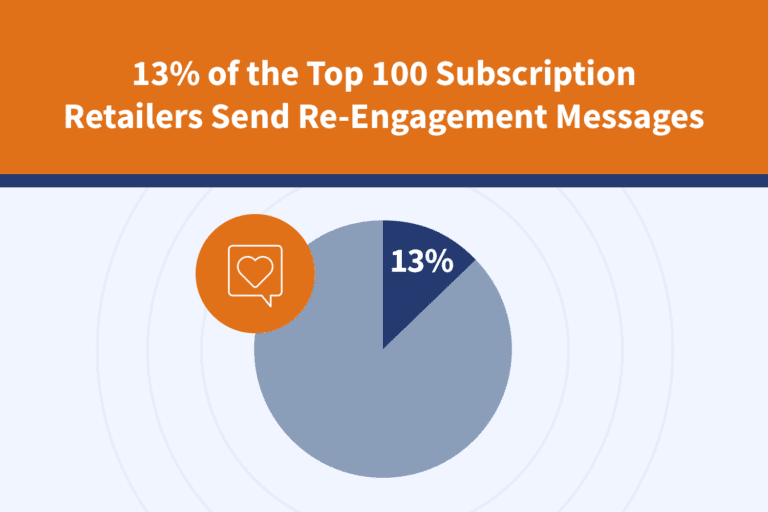 In case you missed it, our User Engagement Top 100 Subscription Retailers report is available for download. 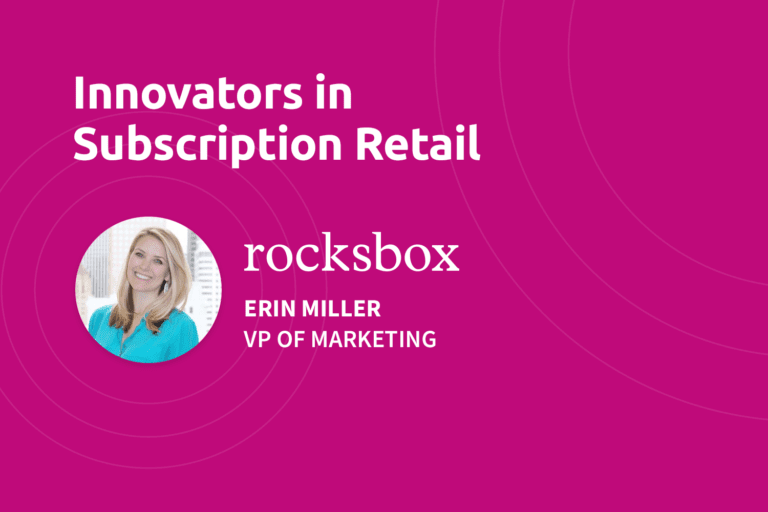 Inside, we uncover the email and mobile strategies used by the top subscription box providers to see how they keep their customers coming back for more. In addition, each week we’re focusing in on one unique part of the customer experience and sharing with you our most meaningful findings. Last week we went through the introductory welcome series and this week we dive into blast campaigns. Email blasts are great for keeping your brand top of mind and promoting your latest products and services — let’s take a look at how different companies leverage them in our infographic below. 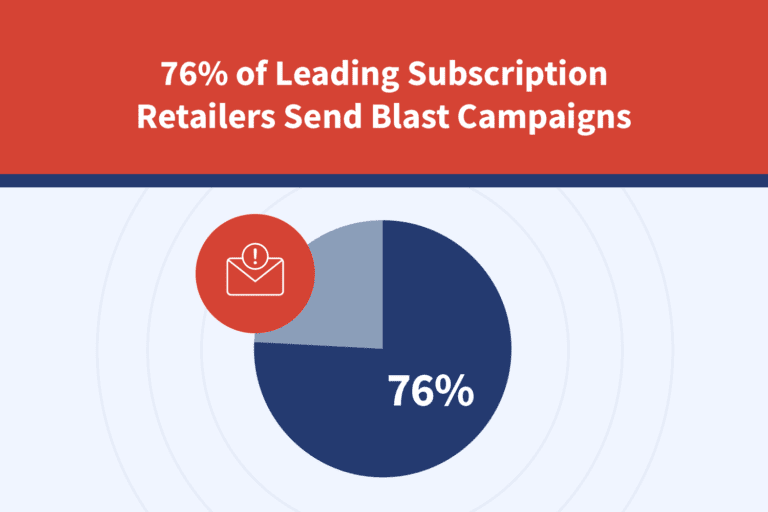 76 percent of the leading subscription retailers incorporated email blasts as part of their marketing outreach during our three-week study. We also noted that retailers stood out when they made an effort to engage customers with relevant content, unique visuals, and clear calls to action. 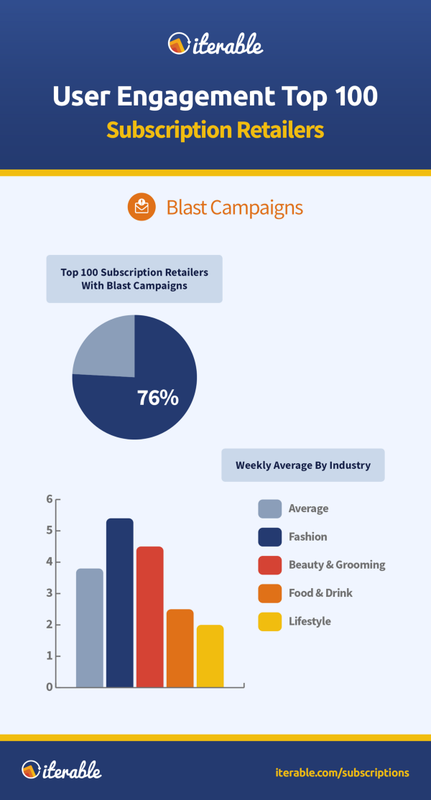 The average number of blast emails sent to active subscribers was 3.8 in one week. Fashion brands sent the most with 5.4 on average, followed by Beauty & Grooming with 4.5 emails and Food & Drink with 2.5 emails. The Lifestyle industry sent the least number of blasts at a weekly average of 2 emails. Dive into the full report if you’re interested in more subscription retail trends and best practices. Here are five great tips to implement today as you start elevating your customer experience. Break the mold — “Humanize” content by appealing to the unique and even quirky characteristics of your brand. Demonstrate scarcity — Offer limited-time discounts or flash sales to create a sense of urgency. Appeal to novelty — Recommend new products to customers with previously demonstrated interest. Showcase social proof — Build credibility by spotlighting positive reviews and video testimonials. Treat your VIPs — Target the most engaged customers with exclusive promotions and referral rewards. Communication is key as you build customer loyalty through engaging touchpoints. Each email you send is a new opportunity to delight your customers and showcase your value — make them count and watch your user engagement rates soar! Tune in next week: we’ll be addressing how companies attempt to re-engage customers who have pulled the plug on their subscriptions.